Whose class are you in? 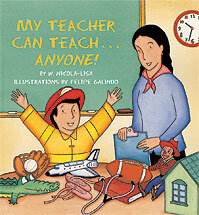 It’s Back to School week on the blog and we’re talking about W. Nikola-Lisa’s My Teacher Can Teach…Anyone!, which is giving me all sorts of flashbacks to that last day of school when you got your report card and on the bottom, all hidden away by the signature lines and stuff, were a few words that would pretty much define your quality of life for the next year: the name of your next teacher. A great review of I and I Bob Marley was written by John Martin on the Boys Read blog, plus some nice words from I and I Bob Marley illustrator, Jesse Joshua Watson.